Folded paper snowflakes have been a popular children’s Christmas craft for generations. If your kids are unfamiliar with them, search online for illustrated instructions. All you need is a pair of scissors and a square of white paper. The paper is repeatedly folded into triangles until it forms a thick wedge. Cuts made into the edges create a symmetrical snowflake design when the paper is unfolded. Glue one large snowflake or several small ones to a brightly colored card. Designs cut from pieces of felt or scraps of cloth can be used to create cards with interesting textures. To form fabric shapes, use cookie cutters or stencils with simple Christmas designs such as stars, trees, or bells. Place the object on the material and trace around the edges with a felt tip pen. Cut out the pattern with ordinary scissors or pinking shears and glue it to the card. Decorate the plain design by gluing on fabric trimmings, ribbon, or sequins. Save the Christmas cards you receive along with gift tags and scraps of used wrapping paper. The following year, these can be recycled as card decorating materials. Cut out a collection of individual printed designs such as Santas, snowmen and Christmas trees. Arrange the shapes onto a blank card and glue them down to form a unique scene or collage. Tempera or poster paints are ideal for use on cards. To create a snow scene, start with a blue card to represent the sky. Use a sponge to dab white paint over the bottom half of the card. Layer blobs of paint to create the texture of fallen snow. Allow the white to dry before proceeding. Paint an evergreen tree, Santa, reindeer or other colorful design so that the lower half partially overlaps the snow. Dip a cotton swab into white paint and use it to dot snowflakes into the sky surrounding the figure. Take some digital photos with a winter or Christmas theme and print out the ones you want to use. They should be about two-thirds the size of the front of your cards. Make a frame out of a piece of plain or printed thick wrapping paper. Cut the paper into an oval or rectangular shape about an inch wider than the photo. Using craft scissors will add a decorative border. Attach the picture to the middle of the frame with a glue stick or rubber cement, and then glue the framed photo on the front of the card. Draw the outlines of stars, wreaths, candles or other simple Christmas shapes on construction paper. Cut them out and place them on old newspaper. Cover each shape with glue right up to the edges. Sprinkle them with glitter and allow them to dry completely before gluing them to cards. Use a glitter pen to add decoration or festive greetings. There is no need to stick to one decorating technique. Any number of methods can be combined to produce an elaborate work of art. Colored markers, ink stamps, and stickers offer more creative possibilities. 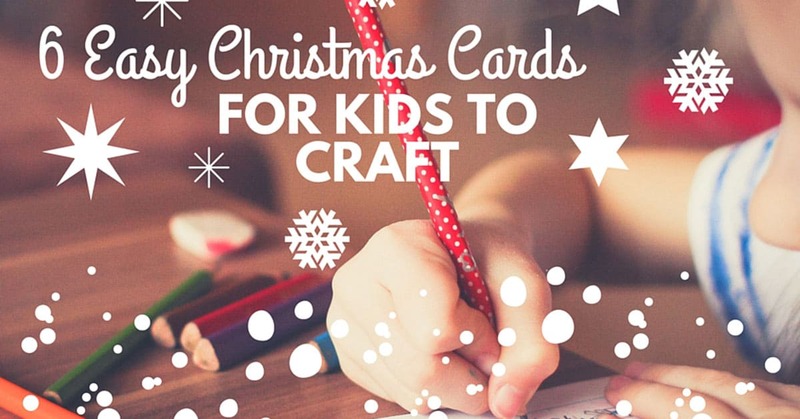 Handcrafted Christmas cards may become precious family keepsakes, so when signing them, children should remember to write the year beside their names.